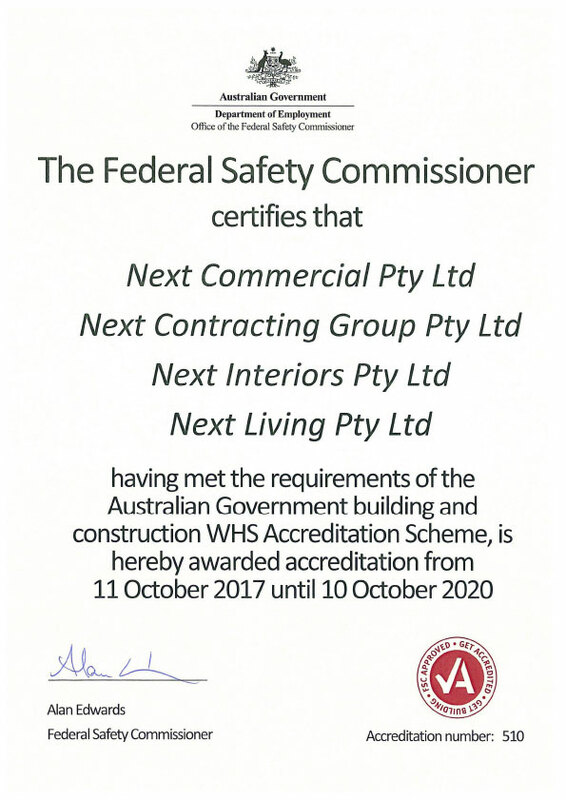 Next has obtained accreditation with the Office of the Federal Safety Commissioner (OFSC), which is the benchmark in health and safety in the building and construction industry. The OFSC accreditation enables Next to tender and enter into head contracts that is funded directly or indirectly by the Australian Government for building works which cover a number of activities including commercial, civil and residential works. “We are proud to join the highly selective list of Australian Building Contractor’s with OFSC accreditation. By aligning our Integrated Management System with OFSC requirements it will provide our clients with assurance that Next has achieved industry leading standards,” said Joseph. Joseph Di Girolamo congratulated all staff involved with the accreditation process and thanked them for their support.